Pavtube BDMagic for Mac, the best Mac 3D/2D blu-ray ripping software, is specially designed for Mac users to backup 3D/2D Blu-ray/DVD to original disc structure with all audio tracks, subtitles and chapter info included. Plus, Pavtube BDMagic for Mac users are able to convert BD/DVD Disc to MKV, MOV, H.264, TS, MP4, M4V, VOB, MPEG and many other formats for multiple mobile devices such as Apple TV 3, iPad 3/4/Mini, Samsung Galaxy Tab 3, Galaxy S4, Google Nexus 7,… for playback. In addition, the useful Mac BD ripper helps users back up Blu-ray and DVD movies to Mac hard drive, copy them to Home Server, NAS for storage and watching them on HDTV and HD Media player including PS3, PSP, Xbox, Dune HD Player, WD TV Live. 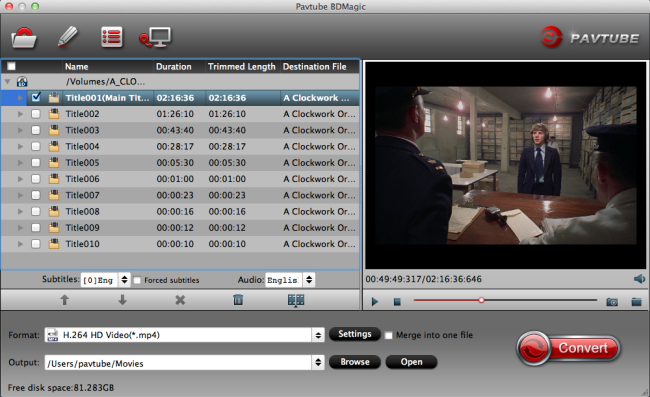 Pavtube BDMagic for Mac supports 2D Blu-ray, 3D Blu-ray and standard DVD Disc as source file. Meanwhile, it allows BD/DVD Folder, IFO/ISO image as source media from Mac hard drive. The "Full Disk Copy" option allows you to make 1:1 copy of Blu-ray and DVD movies with same video/ audio streams, commentary, menus, titles, ads etc. In other words, you are able to get the original file structures and contents of a Blu-ray/DVD Disc without any loss, so it is quite convenient for you to do Blu-ray burning and ISO image creating. And the total time for Blu-ray/DVD back up would within 30 minutes. With the help of Pavtube Mac BD Ripper, you can save a 100% intact M2TS movie from Blu-ray Disc without any quality loss and it is best preparation to get BD Disc back up from BD 50 to BD 50 or BD 25 to BD 25. Convert Blu-ray disc and general DVD to Apple devices like Apple TV/ATV 2/ATV 3, iPad, iPhone 4, iPod 4, and other multimedia devices like PSP/PS3, XBox 360, Western Digital TV HD media player, Seagate Free Agent Theatre, Motorola Droid X, HTC Hero, HTC Magic, HTC Evo 4G, HTC Incredible, Nexus One, Samsung Fascinate, Samsung Galaxy S Vibrant, Blackberry Torch, Nokia N9, Motorola Xoom, Samsung Galaxy Tab 10.1, Toshiba Thrive, etc. and video editing software: iMovie, FCP, FCE, Adobe Premiere Pro, Avid etc. The Mac BD ripper enables users to do primary bur powerful video editing. You could trim and crop video area, merge several videos into one big file, split one large video into smaller video clips, add watermarks… all can be easily handled with simple operation. The Mac BD ripper enables users to select desired languange as output audio track and subs from the source Blu-ray disc/DVD, no matter your mother tongue or other foreign languages. The forced subtitles are available as well.